Point of view slow motion shot of man waving his bare feet in air while sitting on a high cliff over water. 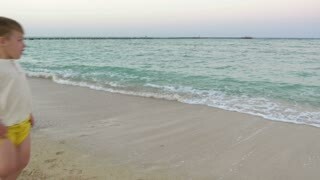 A young man is soaking his feet in the waters of the sea looking down at waves covering his feet. 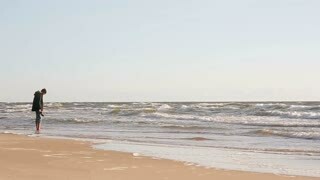 A young man is standing on a beautiful sandy beach soaking his feet in the sea looking at waves covering his feet.